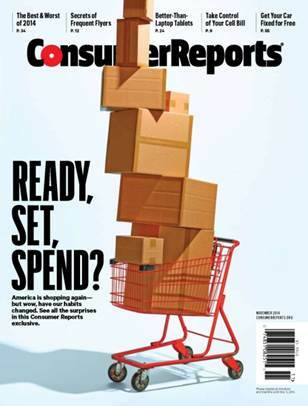 Consumer Reports will debut a new look — both outside and inside — with its November issue. Gone are the cluttered covers of the past. The revamped Reports features a clean cover that tackles a singular topic, and it’s a big improvement. Inside the magazine, editor-in-chief Ellen Kampinsky and VP/general manager Brent Diamond have added some interesting features. Your Advocate, found in the front of the book, features a Q&A with an exec from a major brand (GM’s Mary Barra kicks things off); a section that answers a reader’s specific question; a feature that dispenses insider tips from various industry experts; and plenty more. The updated Reports was based on more than a year of research, but Kampinksy cautions that it’s not a finished product. She also eases readers’ concerns about the glossy changing too much.